The B.O.B. is one of the more useful bike accesories to be invented recently. This photo shows the bob laden with a post hole digger and 50 pound of post hole concrete mix as well as several trimming tools and hardware I used to build the fence around the garden. 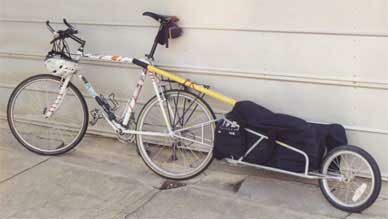 I think I loaded it way beyond its rated capacity but hey it was only pavement travel. Check out next week's shot of our BOB adventures off road!